Sydney Children’s Hospitals Network, NSW Health, NeuRA, Kidsafe NSW, and European Child Safety Alliance join forces to reduce injuries, hospitalisations and deaths in children. In Australia, injuries are still the number one cause of death among children over the age of one with a cost to the nation of over $212 million each year, and a mean cost per child of $3,119. In NSW alone, around 60 children (aged 1-16 years) die as a result of an unintentional injury, and a further 20,000 are hospitalised. In response, NSW child safety and health experts – from Sydney Children’s Hospitals Network, NeuRA and NSW Kidsafe – have joined forces to develop an Australian-first resource, known as the Child Safety Good Practice Guide. This resource, funded by NSW Health, aims to reduce unintentional childhood injuries that lead to hospitalisation or death by providing a summary of good practice, to the extent it is known, for each of the leading causes of injury to children in NSW. It also raises gaps in understanding and addressing child injury prevention to highlight these as important areas for investment for the future. Dr Julie Brown, senior research fellow at Neuroscience Research Australia (NeuRA) explains this Guide provides an invaluable resource for government and advocates for child safety because it summarises all we know on what works to prevent injury. “Nationally, we lose close to 200 young lives annually, a figure that has not reduced in the last 10 years,” said Dr Brown. Effective action is necessary to reduce the physical, psychological and economic burden of injuries on children, their families, and the whole community and to ensure that resources made available for injury prevention are directed to measures that are most likely to work. Good use of evidence is central to achieving this, and knowing what works is at the heart of developing good policy and programs. Dr Susan Adams, Paediatric Surgeon at Sydney Children’s Hospital, Randwick sees the importance of this in her every day work. “In my job I see children and families who only ever wanted the best for their children, whose lives are changed forever in the blink of an eye, due to injury,” Dr Adams said. Working collaboratively, NSW child safety and health experts – including Dr Julie Brown, senior research fellow at NeuRA, Dr Susan Adams, Paediatric Surgeon at Sydney Children’s Hospital, Randwick, Karen Zwi, Community Paediatrician at Sydney Children’s Hospitals Network, and Christine Erskine Executive Officer at Kidsafe NSW – saw the opportunity to provide child safety leadership not only in NSW, but across Australia. This has come in the form of the timely Child Safety Good Practice Guide, funded by NSW Health, and comes as more Australians call out for greater detail and education around child safety issues in their home and close communities and acts as a positive step-forward in eliminating unintentional safety hazards. For organisations like Kidsafe, working at the ‘coal face’ this Guide provides a shortcut to what works highlights Christine Erskine, Executive Officer at Kidsafe NSW. “It is an invaluable tool because we can select methodologies that have been proven to reduce serious injury and which communities respect and recommend because they see the benefits for the children,” Ms Erskine said. 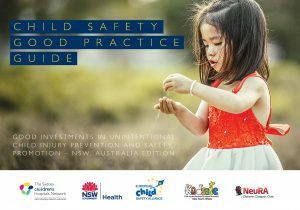 The Australia edition of Child Safety Good Practice Guide builds on previous work by child safety researchers from around the globe. The first Guide was initially developed by the European Child Safety Alliance and saw significant success across the continent. The 2017 Australia publication incorporates a new section on safety guidelines for children in sport and includes: cricket, soccer, horse-riding, cycling, baseball, skateboarding, hockey and snowboarding, as well as quad-bikes, and other off-the-road vehicles. The purpose of the Australia edition of the Child Safety Good Practice Guide is to provide practitioners, decision makers, and legislators with an evidence-focused resource, relevant to the Australian setting, on which they can base their work, funding and recommendations.